The experienced traveller knows and appreciates that one of the best ways to deal with the rigours of travel and jet lag is to keep your exercise regime up even when you travel. The Best Western Plus Chicago Hillside’s exercise room is open 24 hours a day for all our adult guests or accompanied minors. Exercise equipment available includes several treadmills so you can keep up with your running or just to loosen up. A recumbent bicycle, and several upright elliptical trainers for low impact cardio training that will keep you sharp and help you deal with the stresses of travel. A weight machine provides the opportunity for some resistance training, and there is plenty of floor space for putting your yoga mat to stretch out the kinks and do some floor exercises. We provide fresh Hinckley & Schmidt Water so you can stay hydrated during your workout and complimentary towels for your convenience. A flat screen TV allows you to keep up with news or watch the game while you work out. 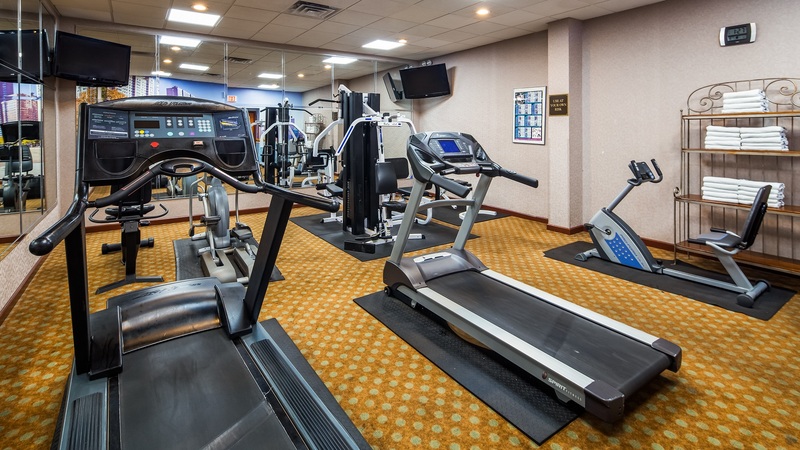 If all that working out has worked up a thirst or appetite guests may order from room service from the exercise room should they require any food or beverages?